Los Angeles, CA – At the ultra plush Terrenea Resort as part of the first annual Interbike Electric Bike Media Event, Kranked unveiled the Kranked Kustoms SCV10 Carbon/EGO electric assist performance mountain bike. 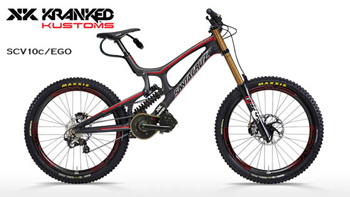 Utilizing the 2012 World Championship Santa Cruz V10 all carbon downhill bike and a custom engineered interface with the high performance off road EGO electric assist, the Kranked Kustom SCV10c/Ego is a state of the art shredding machine. The SCV10c Dh bike is the most advanced performance mountain bike in the world. It is the lightest and strongest downhill bike in production today. The VPP suspension offers 8.5-10 inches of World Championship winning suspension technology. The EGO mid mount electric assist system is the world’s highest performance off road electric assist system. It is engineered in Austria and Germany and delivers incredible performance with the 1200watt system. The system can be custom tuned, to optimize for weight, performance, and riding styles. Kranked Kustoms has engineered a custom interface to optimize the performance of the SCv10c/Ego. The interface is designed to compliment the design of the V10c and Ego and preserve the aesthetics of the bike. Technically the interface optimizes the wiring, tuning, heat dissipation and flex and stress on frame.